With more entrepreneurs and business owners resorting to digitalising their services, on demand services applications have pretty much become everyone’s go to business solution. Be it health care or smart couriers or transportation to food delivery or even have your laundry done up you have it made available via a simple and an effective on demand service mobile application. Catering to the tech savvy millennials and users a start growth in on demand economy is noted. Taking a look into leading online businesses over the years, on demand services applications constitute more than 70% of the online economy. Several start ups including Uber, Just Eat, Airbnb, TaskRabbit and Thumbtack have made a huge name for themselves and have become a part of everyone’s mobile phones. These success models have laid the foundation and have paved the way for a great many start ups that start to reek up huge profits and making a name for themselves. List includes business like Ola, Swiggy, bizzby, Handy, Food Panda, WashMen, Urbanclap and many more prominent business joining them. Laying groundworks for a business is very important for a startup to get off the blocks. With most businesses requiring a thorough homework, On-Demand Service based startups reduce the risks significantly. Will end users and service providers well accustomed to on-demand services, the time to establish is significantly reduced. With some well established startups already in the market, all you have got to do is to inspire from them and use it in your business niche. With on demand services, it is not like each business is novel as such. There is a user offers a service and the service is sought by another user, be it in vacation rental services or taxi booking services or food booking services, it is all the same. Where it all changes is based mainly on the ease of access and service pricing structure. A relevant UI/UX and appropriate functionality to increase the efficiency of the web or mobile application is where all the innovation rests. 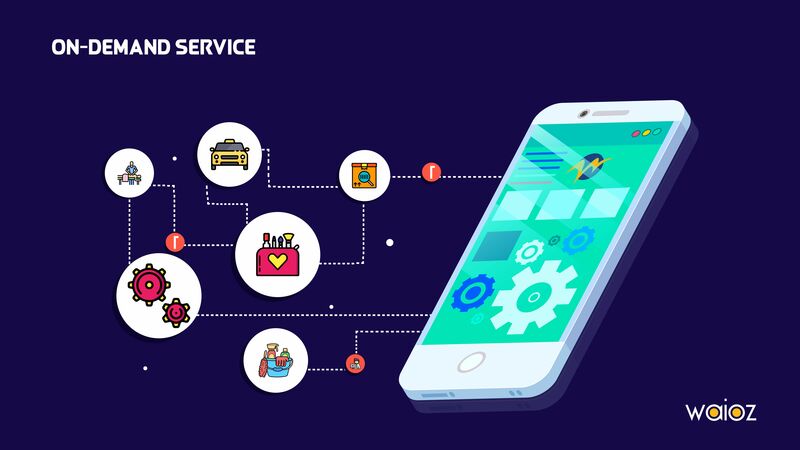 With a forecast of 2.5 billion users of smartphones by 2019 (Source: Statista), of which 94 percentage being within 16 to 30 years old, it is safe to assume that the on-demand services is going to be relevant and growing further. Buying services off their phones, the users are going need an app for beauty and styling services, gardening services, personal training services, sporting arena bookings and so on. Existing business owners who haven’t thought about moving their business digital with an on-demand services application are likely to be left behind in the field, with users switching to the competitors who offer an application for the services. Getting yourself an On-Demand Service Application professionally done is now with your reach. WAIOZ offers a specialized on-demand service framework that you can customize to your requirements. With superior technology and database of choice the framework powers your business to a high speed and an effective application. With design choice set as per your business requirement, your application will be powered by an intuitive design to enable a clean ease of use. Contact WAIOZ and engage in a discussion or request a quote to learn more about the effectiveness of an On-Demand Service Application. We are grateful to have you on our website. Feel free to discuss on any possible opportunity of working together. Get expert insights straight to your inbox, and become a better customer success manager. Subscribe to the Service Blog below.